You should be able to dig the runner plants up and give them to your friends without any difficulties. As for what to do with the matted mass of plants, see the Strawberry Renovation page. Great site! Very informative! I was wondering what to do about leaves on my ozark beauties that are dry and crisp. Do I cut them off at the base of te stem? What about leaves that are just dry on the very edges? I’m sure they shouldn’t be dry like that. My sequoia strawberry leaves don’t have this problem. I’m in Colorado. It is a good idea to remove any dead or dying plant material from your strawberry plants. The mostly-green leaves with crisp edges could either be due to disease or deficiency or damage. It could also be the result of climactic maladjustment by a variety not normally well-suited for your location. is it ok to mulch newly planted strawberry plants with colored bark mulch? Its all I had handy and I just put it on after planting today. It depends on what was used to dye the mulch, but it is probably ok. Good luck! I am having a problem with ants and worms eating all of my strawberries. Can you tell me what would be best to get rid of this problem? I would recommend a heavy application of diatomaceous earth. It does a relatively good job against insect pests and won’t harm you one whit. Good luck! Will a blackened blossom(frost) still have a strawberry of some sort or should I pick them off so the other blossoms will grow stronger? I am just sickened that I was away during this wierd weather and did not cover the berries as I usually would have. The blackened flowers are likely destroyed. I would remove them. Good luck! Hello! I am loving your website. I am a bit confused on the flower removal for the June bearing varieties in the 2nd year. I live in Indiana and we are having a warmer spring than usual. I already have some blossoms on my 2nd year plants, but it still seems too early for them, since the danger of frost is still not passed. Should I pluck off these blossoms or let the plant go to fruit? Thank you for your input. Let the flowers develop on your second year plants. This is the first year for your big harvest! Enjoy your strawberry haul this year. Good luck! hola, mi nombre es addisson. Mis plantas parecer se están muriendo. Es el comienzo del verano y es mi tercer año. el año pasado fue muy bueno. este año se están convirtiendo un poco de café. ¿Podría ser debido a la cambiante en este momento están teniendo? gracias! addisson, podrían estar muriendo para un número de razones. Sus plantas de fresa puede tener una infección o infestación, o simplemente podría ser al final de su ciclo de vida. Si no tienen una patología o infestación, trate de trasplante de algunas de las plantas corredor sanos a una nueva ubicación. ¡Buena suerte! I have two large garden tubs – and want to plant strawberries – obviously this would be small scale to start. They would be in a sunny position. Tips would be useful – particularly the best time to plant. The best time to plant strawberries is either in the spring or fall. In the spring, follow the directions on this page. See Fall Strawberry Plants for more details about the benefits of planting in the fall. In either case, it is best to plant them in the evening to avoid immediate environmental stresses from the heat or sun. Good luck! Can concrete blocks be used as a strawberry planter? Sure! Strawberries can grow just about anywhere if they are given appropriate care. If you plant yours in concrete blocks, feel free to take a photo diary of the process and send it to me. If it is decent, I’ll post your story on the website! Hi, I cut my strawberry plants down last year with my weed-eater. (Not planned) we are having a very mild winter and it looks like they are coming back on there own. Is this going to happen or am I going to have to replant again? The chances are good that they will come back on their own. In fact, you probably did exactly what you should have done, just by accident! Mowing your strawberries is an appropriate part of caring for them each year. See the Mowing Strawberries page for more on that. And, to keep them vibrant year after year, you might want to think about transplanting some of them this next year. Good luck! Hello! I want to plant strawberrys in strawberry pots. I’m not sure if I want to buy plants or grow them from seeds. I might try both. I tryed growing some in 2010 but I only got a few from one plant and the plant died soon after. Could it have been my tomato plants that killed them? They were in pots too. What season should I grow strawberry seeds. I live in louisiana and I’m not sure when I should plant seeds or plants. I want to plant or start growing some as soon as I can. I dont really know what breed of strawberry I should get. I love strawberrys and like to bake with them so I’d like to have a breed that tends to produce alot. Any Ideas? Can I keep potted strawberry plants next to potted tomato plants? I have a big yard but I’ve got dogs that like to eat my plants so I keep them in pots on tables/stands outside. Sorry about all the questions I just really want to grow strawberrys to eat and bake with! Growing strawberries from seed can be rewarding, but it is much easier just to buy strawberry plants and stick them in the ground. It is unlikely that your tomato plants themselves killed the strawberry plants. They can carry pathogens that affect strawberries, however, and the Louisiana temperatures and climate may have done your plants in also. A Zone 9 variety would likely do well for you compared to many of the others, and you can see which varieties are recommended specifically for Louisiana on the Recommended Strawberry Varieties by State page. I bought a packet of 4 strawberry crows about 1.5-2 months ago and have planted them in pots. 2 of the plants had some green growth but the other two didn’t. since then the green growth has wilted and disappeared and none of the plants have started growing at all. Can anyone tell me what I’m doing wrong (I live in the southern hemisphere btw. so it’s spring here). Any information or tips that anyone could provide would be greatly appreciated. I’m pretty sure i’ve planted them at the right depth. perhaps not enough water? If it is a water problem and I give them more water now will they sprout or are they dead? I hope someone can help – thank you in advance to anyone who reads this question and triple thanks to anyone who can offer advice. It sounds like your crowns are probably dead. If you watered them appropriately, planted them appropriately, and the living shoots that were on them have wilted and disappeared, you’ll probably need to start over with some new crowns. You could have damaged the plants, planted them in soil that had deadly pathogens, or just gotten unlucky. 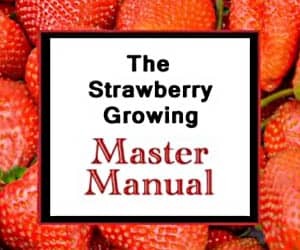 Read the Growing Strawberries page to get a better idea if you did something wrong or if something else did your plants wrong. How do I protect my strawberry plants for winter if I do not have access to pine needles or straw? I am planting them this fall. Do you know of a good site like this for raspberries and blueberries? Unfortunately, if you haven’t gotten fruit by this point, you are likely going to have to wait until next year. Take care of them over the cold months, and they should produce next year. Don’t forget to water them well this fall when their flower buds (which will produce fruit next year) are forming. Now, where to start…early this spring I ordered a pack of 25 Earliglow plants from a supplier (who shall remain nameless). The plants arrived in excellent condition, however, instead of receiving 1 pack of 25 plants, I received 25 packs of 25 plants, so 625 plants in all!. I called the supplier to inform them of their mistake and was to to just keep them, throw them away or give them away. Being an avid gardner, I couldn’t throw them away. Since I own a couple of acres, I decided to put in a dedicated bed and planted 100 of them (the rest I gave away to friends and family). Here’s the problem: I ammended the soil for the bed, planted, and pinched every bloom this year. Now the plants are going crazy. I have runners everywhere. The rows are 3 feet apart, but the plants are only about 12-18″ apart. At the rate they are growing, I won’t be able to walk in the patch by the end of summer. So, my question is, this fall, can I remove some of the runner plants and transplant them to another larger bed that I will prepare during the summer? Should I do it now, in the fall or wait until spring? We preserve many different things from the garden such as tomatoes, beans, beets, grape jelly, etc, etc so adding strawberry jam would be a welcome addition. Thanks for any advice. Most likely, the new vegetation is growing from the crown and is simply more leaves. The small yellow pods are probably going to turn into strawberry flowers shortly! Thank you. So, there is no need to remove the blossoms from the runner plants? I don’t know if we’ve ever fertilized or spent time watering them. So, I think we’ll start by thinning the plants, fertilizing them and watering them. We are also planning to sterilize one of the beds, as it is infested with weeds that we have been unsuccessful at erradicating. Then we plan to transplant some plants. When we do this what would you suggest that we mix with the soil to make it more suitable for strawberries. I read somewhere, maybe on your site, that strawberries like sandy, loamy soil. Should we actually mix sand in? Or peat moss? How much? Thanks again. No problem. Every productive effort a plant makes takes from its total productive capacity. So, it usually is a good idea to snip or pinch the flowers from new plants that you are going to transplant. Doing so helps the plant’s productive energy go to establishing its root system, which in turn makes the entire plant more productive down the line. Rich compost-y soil with a bit of sand is great for strawberries (and peat moss can be a good additive as well), but you can add too much of just about anything. The best approach is to contact your local agricultural extension and have them run a soil test to tell you exactly what is needed for your particular situation. We have strawberries in raised beds. We are getting smaller and smaller berries every year. I think I need to thin the plants. Is there a way to tell by looking at them which plants are oldest? We also need to fertilize and water them. We were really just letting nature take it’s course. With a fair amount of success until now. The berries are just mostly really small this year. Thanks for this page. It was very helpful. I’m also wondering if when you create new plants from runners are you supposed to pinch off the blossoms on those or just on new bare root plants? If you are supposed to pinch them off the new runner plants, how can you tell which plants are new in the Spring? They all look the same to me in the bed. Thanks. It is difficult to tell which plants are oldest after the first year (until the old ones start dying off). You can, however, often gauge which plants are oldest by the size of the crown. Older strawberry plants will often have larger or multiple crowns at the base, while new runner plants will have a single, smaller crown. What you are experiencing is a classic case of strawberry plants losing their vigor and vitality. To keep this from happening in the future, you might want to adopt the system described here: Transplanting Strawberries. I’d like to replace a grassy slope (~ 6 ft x 20 ft) into a strawberry patch. Are there special considerations for hillside planting? 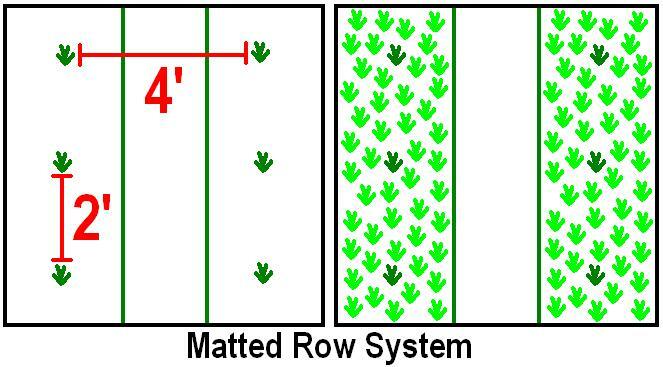 Usually, the matted row system will work best on hills. To minimize erosion, however, it would be advisable to allow additional runner plants to root. This dense matted row will do a better job at securing the soil, but berry size and quantity may be slightly compromised. Other factors to consider are potential difficulties in watering, mowing, and the renovation process. My name is Marion Martyn and I live in Galway in Ireland. I would like to grow strawberries commercially. I would like to work on a stawberry farm in the USA and learn everything. Do you know anyone who would take me on for a month or two. Click this link for information on how to get a job picking strawberries. This year I am planning my first garden. My reserch that I have came across shows some vegatables do not do well planted by each other. Planning to plant strawberrys in the garden. Can not find information. What not to plant by strawberrys. Please help. Strawberry plants propagate in 3 main ways (see here: Propagating Strawberries). If your plants grow additional crowns at their bases, you can split these off and re-plant them. But, don’t cut a crown in half and plant each half. 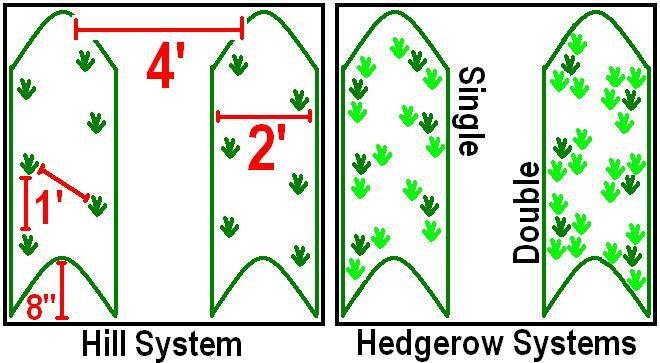 Some nurseries do ship these rhizomal divisions, and there is nothing wrong with that as long as the plants are healthy. Each rhizomal division will grow into a healthy, individual plant, assuming good conditions. Thanks for the information here. I would like to know how many years I can sustain the plants please. I ask this because it would be great to continue on and keep the same plants growing for as long as possible. I have heard that three years is maximum but surely if you move plants/cutting around to different beds you will be able to keep grwoing for MANY years. If you take any single strawberry plant, it will begin losing its vigor at about 3 years of age, in most cases. Age 3 for a strawberry plant is like age 50 for a human, so to speak. Few individual plants will make it to 6, just like few people make it to 100. And, productivity tends to drop off for most strawberry plants and people after that half-way mark as well. But, just like people who can keep their “line” going indefinitely through children, so can strawberries through their runner plants. If you start with even a few plants, you can keep growing strawberries forever if they don’t get diseased and are well cared for. To see how to do it, see this post: Transplanting Strawberries. Hi, in you renovation section for June berry type, you specified that 0.5″ soil needed to cover the crown in order to encourage the root development. I thought the top half of the crown has to be above the soil line in order to avoid the root rot or crown rot. Renovation should begin right after harvest. The crowns, like you mention, shouldn’t be buried completely. 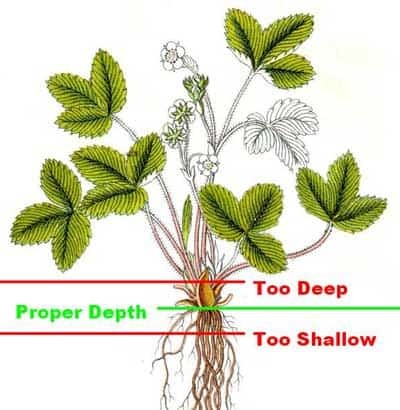 Since the majority of a strawberry plant’s roots are relatively close to the surface, spreading a little extra dirt around your strawberry plants can help the roots remain healthy and expansive. Once the temperature of the soil is 40 degrees Fahrenheit in the winter (this usually happens after multiple frosts), the plants should be mulched. This can be accomplished with straw, row covers, or other suitable materials. The mulch will protect the plants from cold injury during the winter.